1. What can fans expect from this squad in 2015? Offensively, we are more well-rounded. We have a tremendous mix of guys who can get on base, speedsters, power bats who can change the game with one swing, etc. It’s no secret last season we struggled to push across a run at various points. This year, we’re going to be much improved when it comes to guys stepping up and being able to drive that run in for us. 2. What is the one thing that this year’s team does best? Our identity is always going to be about trying to be the best defensive club in America, the best situational pitching club in America and trying to dominate at Dudy Noble Field. We really put an emphasis on trying to get the extra-base hit, trying to lead the nation in doubles, trying to take advantage of the gaps and be more reckless with our runners on the bases. We have to have a smart recklessness though. That is what we want the identity of this club to be. 3. Bottom of the ninth, tied game, two outs, winning run on second … which player does this team want to step up to the plate? There are so many clutch players on our team so it’s hard to pinpoint just one, but if it’s driving in a run, I’d have to go with senior first baseman Wes Rea. He led the team last year in RBI and two-out RBI and when it comes to clutch, he’s a .300 hitter in 18 career NCAA tournament games. He hit .429 with a home run against No. 1 Louisiana-Lafayette last year at their place. He helped lead us to Omaha in 2013 with a clutch home run at Virginia in the Super Regional, and when he played at TD Ameritrade Park, he had several more key hits which helped us reach the finals. When the game is at its biggest moment, he always seems to deliver. That’s why he’s been voted team captain the last two years. 4. If this team had one game to win, which pitcher would get the ball? How can you go wrong with All-American southpaw Ross Mitchell? He’s 24-5 in his career with a 1.93 ERA. Inside the rugged Southeastern Conference, his career ERA drops to 1.85. If it’s just one game, there’s a good chance he might go the distance. After all, he led the SEC last year with four complete games. He is an absolute workhorse with success in the nation’s toughest conference and on the game’s biggest stage – Omaha. As a fifth-year senior, he has learned to embrace the game’s biggest stages, and that’s something you can’t teach which makes him extremely successful. 5. Who are we most likely to see make a "SportsCenter Top 10" play on this squad? Like the previous two questions, this is also extremely difficult. One of our biggest identities is being able to defend the entire field. Our first baseman Wes Rea is statistically the best fielding first baseman in 124 seasons of MSU baseball. Our shortstop Seth Heck was voted by SEC coaches last spring as the best defensive shortstop in the league. We have guys like Matthew Britton at third base who can take away the bang-bang play at first by firing a 90 MPH heater over to Rea. In the outfield, we have speedsters like Jacob Robson and Michael Smith who can cover so much ground and dazzle you with quickness. In the corner outfields, we have guys like Joey Swinarski, whose right arm reminds people of first-round draft pick Hunter Renfroe. Behind the plate there’s Gavin Collins, who was top five in the SEC last year in throwing out baserunners. I guess what I’m trying to say is that when you return most guys from a group which finished top five in the NCAA in 2014 in fielding percentage, it’s going to be tough to pinpoint one person to make a top-10 play. You don’t play for coach Cohen unless you can routinely make such plays on a daily basis in practice. 6. What does Omaha mean to this team? It means everything. It’s why those guys wake up every single day and work as hard as they do and sacrifice as much as they do. If you ask guys like senior infielder Seth Heck, winning a national championship will be the only way 2015 is defined as a successful season. 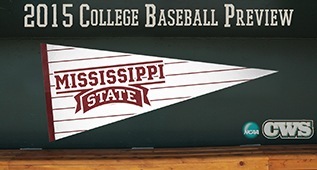 Going to Omaha is why baseball players sign with Mississippi State. When you still have guys on the team who were so close to a championship in 2013, listening to their experiences of how heartbreaking it was just drives you to get back and finish the deal. Our program has been nine times, so a lot of the guys feel it’s their obligation to those who came before them to go back there a 10th time and win it all. The alumni deserves it, the university deserves it and the greatest fans in college baseball deserve it.